On August 31, 2018, President Donald Trump announced the nomination of David Vela, Superintendent of Grand Teton National Park, to serve as Director of the National Park Service. Mary Ellen Sprenkel, President and CEO of The Corps Network, offered the following statement in support of Superintendent Vela’s nomination. On behalf of our nation’s 130 Service & Conservation Corps, we applaud and strongly support the nomination of David Vela as National Park Service Director. Throughout Mr. Vela’s esteemed career at the National Park Service, Corps around the country have had the pleasure of working with him to help develop the next generation of diverse leaders, and address important conservation, maintenance, and recreation needs at our national parks. With over 28 years of experience with the National Park Service, Mr. Vela has the knowledge and vision to move NPS forward into its next chapter. We are confident he is up to the task of ensuring our parks are accessible and in good condition for the millions of visitors that enjoy them each year, and for the thousands of businesses, communities and partners that surround parks and help them flourish. Congratulations to Mr. Vela, and we look forward to the U.S. Senate acting on his nomination as soon as possible. The Corps Network, the national association of Service and Conservation Corps, provides leadership and support to over 130 Corps across the United States. Through advocacy, and providing Corps access to funding opportunities and expert guidance, The Corps Network annually enables more than 25,000 Corpsmembers to strengthen communities, improve the environment and transform their lives through service. 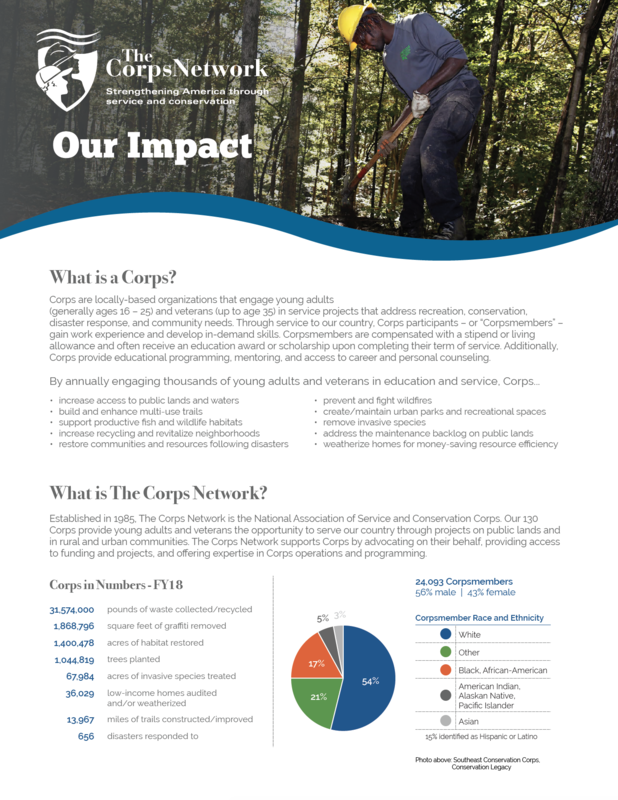 To learn more about The Corps Network, please visit www.corpsnetwork.org.